Entering the reporting module, you go directly to the system dashboard but the module is split to 3 sections. All graph or list colors are based on the MyStudy color experience - see the details >here<. 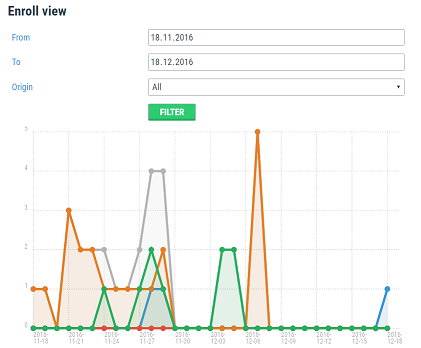 * Detailed graph view is available when you click on the graph. * Course completion - number of courses that were completed out of total enrolled courses. The graph contains all course statuses, includes enrolled courses as well. 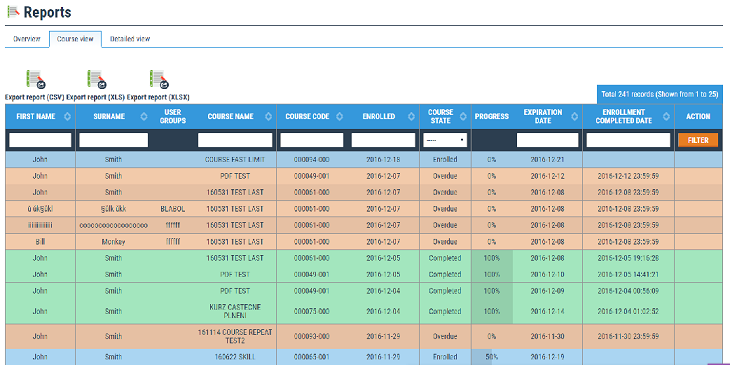 * Enroll view - timeline shows the number of courses enrollments and their completion rate. * Time to complete - shows the speed of courses completion. The graph shows days of completion compared to total enrollment days. The course is calculated into statistics once it reaches its completion or due date, doesn't include enrolled courses. 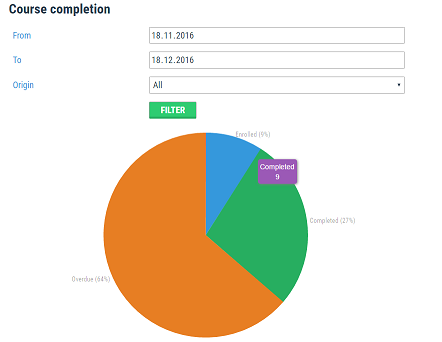 The graph is more green when courses completion is fast and becoming yellow and red when completion time is close to enrollment time. - Course view displaying the list of courses enrolled to the users. * Each row is colored by its actual fulfillment status, for a better admin orientation. You immediately see the course status, colors are based on the MyStudy color experience - see the details >here<. * You may export all the data in the csv, xls, xlsx formats and perform additional detailed analysis in your spreadsheet editor. 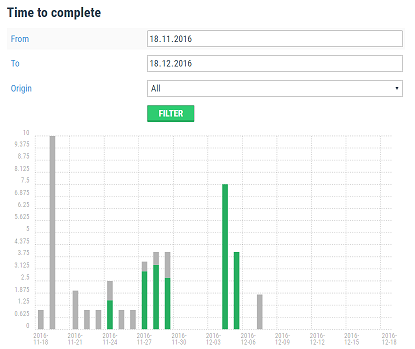 * Progress - allows you to recognise immediately where the users are with the course completion. It's shown as percentage against the completion score, NOT the % of competed lessons! eg. when the course completion score is set to 80%, the course contains 2 lessons. In case 1 lesson is completed, the progress will show 62%. See the Course Create. - Detailed view displaying all course, lessons and answers system information. You may export all the data in the csv, xls, xlsx formats and perform additional detailed analysis in your spreadsheet editor. Edited 5 time(s). Last edit at 12/26/2018 03:46PM by Masteradmin.